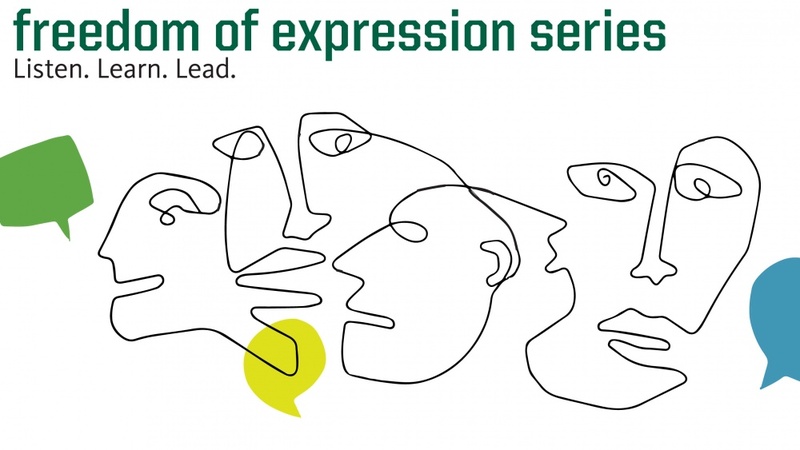 Building on a successful winter term launch, the Freedom of Expression Series continues through spring with several campus events aimed at nurturing inclusive conversations on the value of free expression, the importance of the First Amendment and the effect of speech on community. The events during winter term were hosted by six departments, schools and colleges and welcomed about 250 students, faculty, staff and community members. But the series is not over yet. Spring term will bring new events to discuss subjects like free speech in educational settings, the relationship between design and the First Amendment, and activism in sports. Events this term begin April 30 with the College of Education hosting an interactive panel discussion with Eugene high school students and educational experts from around the state who are concerned about freedom of expression on high school and college campuses. The event will feature a tiered panel discussion addressing issues of free speech in the classroom. Register online to reserve a seat. The College of Design will create a collaborative art display showing the progression of freedom of expression at the UO. People interested in participating should meet in the Lawrence Hall courtyard at 5:30 p.m. Wednesday, May 2. The exhibit will explore peoples’ right to seek, receive and impart information in the form of art. This event will conclude at 5:30 p.m. Friday, May 4, in Room 115, Lawrence Hall with a lecture by Sara Zewde, a landscape architect and planner with Gustafson Guthrie Nichol in Seattle. She will discuss typologies of memorial, cultural memory and the First Amendment. May 8 will bring an entire day of discussion around activism in sports and the sports industry. The Lundquist College of Business and Department of Intercollegiate Athletics will host two panels with UO student athletes, professional athletes and sports broadcasters from around Oregon. They will discuss the ways in which activism by athletes and sports organizations effects the business ecosystem within sports. The final event of the day will be a lecture from Harry Edwards, a civil rights activist and emeritus professor of sociology with the University of California, Berkeley. Edwards will share insights about the value of free expression and the importance of inclusion within the world of athletics. Join faculty and graduate student teachers May 18 to learn and practice strategies for enhancing student learning through discussion. Discuss the purpose and parameters of class discussion, prepare for potentially challenging conversations, and help students learn from raw classroom exchanges. The award-winning theater troupe Rehearsals for Life will enact a scenario for the group’s analysis. Online registration is free. The campus community is invited and encouraged to participate in the events and in the ongoing discussions they are meant to stimulate. Use the hashtag #expressUOself to join the conversation on social media.